A few days after music streaming service Grooveshark shut down and settled with the major record labels, the site was 'resurrected' by unknown people. While the reincarnation bears more resemblance to a traditional MP3 search engine than Grooveshark, the labels are determined to bring it down. Earlier this month the long running lawsuit between the RIAA and Grooveshark came to an end. Facing hundreds of millions in damages, the music streaming service settled the dispute for $50 million while offering an apology for the mistakes that had been made in the past. The record labels celebrated the outcome as a victory, but after a few days they had a new Grooveshark problem on their hands. A person naming himself “Shark” had launched a new music service using the familiar Grooveshark brand. Contrary to most press reports proclaiming a near-complete return of Grooveshark, the site itself appeared to be mostly an MP3Juices clone. However, the use of the Grooveshark name was enough to have the record labels worried. 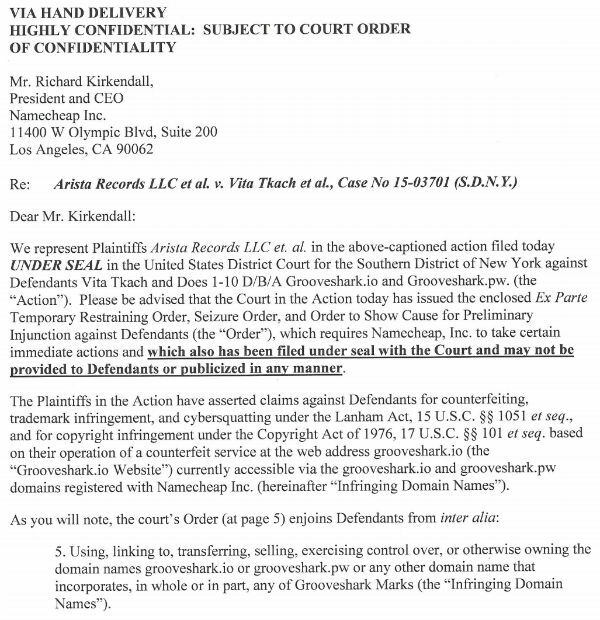 In a complaint filed under seal at the Southern District of New York, the labels are now suing the people behind Grooveshark’s reincarnation. The labels accuse the site’s operators of counterfeiting, trademark infringement, cybersquatting and copyright infringement and immediately applied for countermeasures to shut the site down. Earlier this week District Court Judge Deborah Batts sided with the labels, issuing the requested temporary restraining order as well as a seizure order directed at the site’s operators, hosting providers and domain registrar NameCheap. “There is good cause to believe that, unless the Defendants are restrained and enjoined by Order of this Court, immediate and irreparable harm will result from the Defendants’ ongoing violations,” the Judge writes. Under the temporary restraining order the site’s operators are barred from using Grooveshark trademarks and logos and it also prohibits hosting providers from working with the site. In addition, NameCheap was ordered to seize the domain until further notice. Namecheap swiftly complied with the order and as a result the site’s domain names including Grooveshark.io are now inaccessible. The operator of the ‘new’ Grooveshark, however, is not impressed by the legal fireworks and will continue to run the site from the new Grooveshark.vc domain name that was just launched. “I have one message for those responsible for this hostile take over: You will not stop us. We won’t give in to this type of bullying,” Shark informs us. “On the contrary! The harder you come at us the stronger we’ll fight, and now after this hit we’re more determined than ever to keep Grooveshark alive and kicking,” he adds. In addition to relocating to a new domain name Shark says he’s added several developers to his team. A few days ago the team released the much requested playlist feature and in the near future he hopes to make the entire project Open Source. And so a new game of Whac-A-Mole has started. Update May 18: The new domain has been nullrouted as well.